New black bass fishing regulations went into effect throughout Florida Today. On Friday July 1st, the Florida Fish and Wildlife Conservation Commission announced. The new regulation change will streamline existing rules. Allowing anglers to keep smaller and more abundant bass which protects larger bass. Lake Okeechobee bass fishing no monsters today, but lots of action. What a day on the Big O with Fred. Even with 40 mph winds, he still captured some nice one's! It was not easy but he did a great job. Lori Lupton2014-07-07T18:58:14-04:00March 25th, 2013|Categories: Florida Fishing Reports, Lake Okeechobee, Largemouth Bass, South Florida Fishing|Tags: Bass Fishing, Capt Mark Shepard, Florida Bass Fishing Lakes, Lake Okeechobee Guide|Comments Off on Great Job Fred! What a day on the Big O with father and son, Pat and Patrick. When you get a chance take a kid fishing. Awesome!! 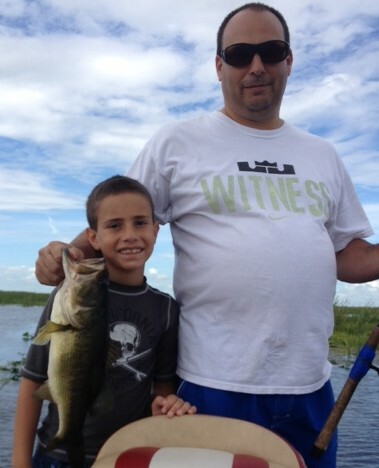 Kendal and Elizabeth went bass fishing on Lake Okeechobee. He is a fly guy, so they did some fly fishing. They caught a nice 5.6lb largemouth! Excellent job guys! Hey it was a great treat to fish with Kurt Chelminiak from Wisconsin. Kurt is one great angler and one great guy. We both have fished on the road with FLW and have had allot of fun talking about our adventures.